Cloudy with rain and snow early changing to all rain and becoming intermittent late. High 46F. Winds N at 5 to 10 mph. Chance of rain 70%. Snow accumulations less than one inch..
Cloudy skies this evening will become partly cloudy after midnight. Low 29F. Winds E at 5 to 10 mph. The abundance of high mountain lakes in southwestern Montana presents innumerable great opportunities to Take It Outside. The hard part is deciding where to go. Pick a mountain range, then pick a lake. Besides the stunning scenic beauty, the exercise gained hiking in and out is the added benefit. 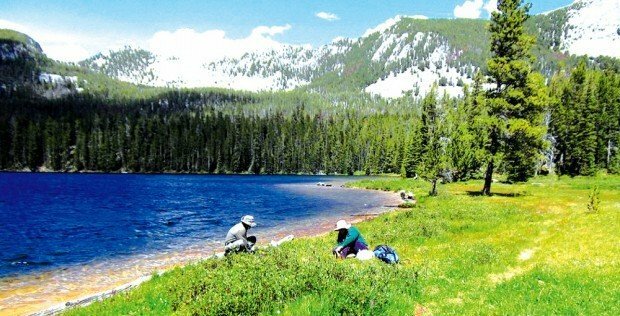 Sawtooth Lake, located toward the south end of the East Pioneer Mountains, northwest of Dillon, offers a 3.7-mile jaunt into a pretty area tucked at the base of craggy ridges. The recently improved trail enables relatively easy walking: from the trailhead to the lake, the gain is around 1,500 feet. The first few miles take hikers through an old burn area, which on Sunday brimmed with the purple blossoms of fireweed, some of it over 5 feet high. The trail then proceeds through a relatively dense forest, where birds - mostly juncos - chirped from the depths of the pine and fir trees. At the end of the trail, hikers are greeted with spectacular views of the jagged ridgeline and the crystal clear water so typical of high-mountain lakes. Wildlife flowers are in abundance - blue gentian, elephant heads, asters, lupine, arnica and cinquefoil, to name a few, presenting a colorful contrast to the green grasses around the lake. An added interest factor is the wreckage from an airplane crash from years ago seen at the east end of the lake. On the hike out, people get a bird's-eye view of the Maverick Ski Area, located on the west side of the Pioneer Mountains Scenic Byway highway. To get to the Sawtooth Lake trailhead from Butte, it's a bit of a drive: about 85 miles, but the good news is it's a beautiful drive. Take Interstate 15 south and turn at Divide, onto Highway 43, proceeding west to Wise River. At Wise River, turn south on the scenic byway, head south around 30 miles or so until you get to the Maverick Ski Area on the right. Then watch for signage. You'll turn east, or left, and drive four miles on a good graveled road (sedan friendly) to the trailhead. From Dillon, the drive is about 45 miles.